The purpose of this handbook is to improve the operation of freeways and their associated ramps by providing support, information, guidance, and recommended practice to practitioners responsible for freeway management and operations. However, before we can discuss the strategies used to manage traffic on ramps, including how we develop, design, implement, operate, maintain, and report their performance, we need to take a step back and describe the need for and importance of ramp management, and the role that it plays with respect to the successful operation of freeways, arterials and, to a broader extent, the entire surface transportation system. Over the last half century, the public’s increasing demand for fast, efficient, and convenient means of travel has resulted in greater use and dependency on existing transportation infrastructure, including freeways and their associated ramps, to meet their personal and/or business needs. This increased demand, in part a result of a growing population and increased auto ownership, has resulted in longer periods of congestion and deterioration of transportation infrastructure. As a result, motorists today must endure longer periods of delay and more safety problems than they have in the past. 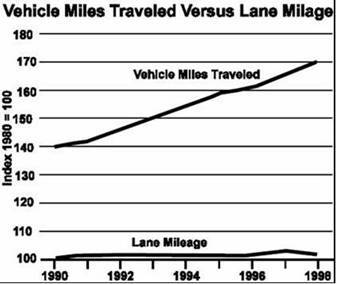 As congestion, collisions, and other transportation-related problems continue to increase, improvements to transportation infrastructure in the form of additional lanes and new roadways has lagged behind (see Figure 1‑1). For many agencies the cost of making these improvements, both financially and institutionally, are too great. In many cases agencies have considered methods that make better use of existing capacity. These methods include the use of advanced technologies and more efficient procedures. These technologies and procedures are often integrated into the context of freeway management programs that seek to manage, operate, and maintain regional freeways in an efficient and cost-effective manner. Ramp management is one of several functions performed on a daily basis to fulfill agency-defined objectives of freeway management programs. Ramp management strategies are often integrated with other freeway management program elements to better meet freeway management goals and objectives and to maximize use and benefit of existing transportation investments. The following sub-sections expand on the ramp management discussion provided here, by providing a more comprehensive definition of ramp management including goals and objectives, providing a historical background, identifying observed benefits, and expanding upon the relationship to freeway management briefly described above. 1.1.1 What is Ramp Management? Managing traffic on freeway entrance and exit ramps, or ramp management, is the “application of control devices, such as traffic signals, signing, and gates to regulate the number of vehicles entering or leaving the freeway, in order to achieve operational objectives”. Most ramp management strategies are employed to balance freeway demand and capacity, maintain optimum freeway operation by reducing incidents that produce traffic delays, improve safety on adjacent freeways or arterial streets, or give special treatment to a specific class of vehicles. Ramp management strategies and the systems that support them are often implemented in conjunction with other freeway management programs to create operational efficiencies and to assist in the delivery of overall transportation management goals and objectives. Ramp management strategies may be used to control access to selected ramps, thus limiting the periods when vehicles may access the ramp or possibly restricting access to the ramp permanently. This significantly reduces, or may even eliminate, the potential for collisions that occur as a result of traffic entering or exiting the ramp facility and in turn smoothes the flow of traffic on segments of roadway where these collisions have occurred in the past. Ramp management may also control the manner in which vehicles enter a freeway. For instance, vehicles that enter the freeway in platoons introduce turbulence, which causes vehicles on both the mainline and ramp to slow down to safely merge. This causes congestion around and upstream of ramp/freeway merge points. Ramp management strategies may be used to control the flow of vehicles entering a freeway, thus smoothing the rate at which vehicles are allowed to enter the freeway. 1.1.2 Why is Ramp Management Important? Understanding why ramp management is needed begins by defining what ramps are and what purposes they serve. Simply speaking, freeway entrance and exit ramps connect high-speed, limited-access freeways to other high-speed, limited-access freeways or lower-speed, principal arterials/highways, and vice versa. Additionally, ramps are the only facilities motorists may use to legally make connections to and from limited access facilities and as such represent the only locations where traffic entering and exiting a limited access facility can be controlled. If designed, operated, and maintained effectively, ramps allow motorists to make connections between different facilities in a safe, convenient, and comfortable fashion with little or no delay or impact on traffic. However, conditions on ramps seldom represent the conditions for which ramps were initially designed. Instead, ramps are often too closely spaced, do not offer adequate acceleration distances for posted speeds, or are simply overwhelmed by the increasing number of motorists that use them on a daily basis. When conditions like these exist, impacts may develop that affect the efficient and safe operation of traffic on ramps and/or the facilities to which they are connected (i.e., freeways and arterials). Despite poor conditions, however, agencies can proactively manage traffic on ramps to obtain desired benefits or to satisfy pre-determined goals and objectives. Ramp management also serves as an effective medium through which agencies can collaborate to address needs more effectively. Since ramps often join facilities that are operated by different agencies, ramp management can break down barriers that exist between agencies, allowing agencies to work together more effectively to address issues. For instance, a state agency such as the Department of Transportation (DOT) may operate a freeway including adjacent ramps, whereas a local agency such as a city engineering department may be responsible for operating the street or arterial that runs parallel to and connects with the freeway ramp. Using ramp management strategies and techniques, the state and local agency can work together to address traffic problems near the ramp, while remaining cognizant of each others’ concerns. The rise of freeway congestion and safety problems originated during the economic growth and land development that took place shortly after World War II. In 1956, the need for transportation facilities prompted the U.S. Government to launch the Interstate Highway program. As demand, speed, and congestion increased, collisions became more prevalent and safety became a recognized problem. The response was to study the relationships between capacity and demand on freeways and the impact of the demand-capacity relationship on safety and congestion. Better understanding of freeway flow led to a variety of methods to manage traffic demand on freeways. Ramp management was one technique born from this investigation. The early 1960s saw the first successful attempts to manage traffic entering freeways from ramps. In 1963, ramp meters were deployed along Chicago’s Eisenhower Expressway and were manually controlled in the field by a traffic enforcement officer, Over the next several years, successful ramp metering experiments were conducted in Detroit and Los Angeles. With ramp meter successes came interest in developing new ramp management strategies. In 1967, Los Angeles implemented the first known ramp closure, and in 1972 Minneapolis introduced bus bypass lanes at metered ramps to promote use of transit. Over the last four decades, ramp management strategies such as ramp metering and ramp closure have flourished as effective ramp management strategies and have continued to evolve to meet the additional demands of the public and the constraints inherent in public agency budgets. Today, ramp management strategies are commonplace in jurisdictions all across the United States. For instance, ramp metering systems have been deployed in 26 metropolitan areas, with 12 having at least one HOV bypass lane. Similarly, at least six agencies have indicated they have temporarily closed ramps that enter or exit freeway facilities. The use of ramp management strategies is also growing. For instance, in 2002, there were approximately 2,160 ramp meters deployed within the United States. By the end of 2005, it is estimated this number will rise to roughly 2,370. Based on this fact, it is critical that practitioners have the tools needed to effectively implement these strategies. A summary of ramp metering activities in Minneapolis, Chicago, Los Angeles, and Detroit is provided below. The first ramp meter was installed on Chicago’s Eisenhower expressway in 1963. By 2000, a total of 113 ramp meters were in place on regional freeways in the Chicago metropolitan area. In 1970, the first two ramp meters were installed on I-35E north of downtown St. Paul. Initially, these meters were operated on a fixed-time basis; however, only two years later they were upgraded to operate on a traffic responsive basis. At this same time, another four meters were activated. In 1974, another 39 meters were activated, bringing the total number of meters to 43. Evaluation of the ramp meter program up to this point indicated that the metering program had been a success. Consequently, more than 300 additional ramp meters were installed before 1995, bringing the total to 368 ramp meters. Today, Minneapolis has one of the largest ramp metering programs in the United States and has been the focus of several evaluations. The results of these evaluations indicate that ramp metering has produced several benefits in terms of safety, improved mobility, and reduced environmental effects. Although early experiments with ramp metering were conducted in the Detroit area, no permanent meters were installed until the 1980s. In November 1982, the Michigan Department of Transportation (MDOT) installed six ramp meters on eastbound I-94 (Ford Freeway). The ramp meters were part of MDOT’s Surveillance Control and Driver Information (SCANDI) system. During the mid 1980s MDOT increased the number of ramp meters on I-94 to a total of 28. An evaluation of these 28 meters showed a significant increase in vehicle speeds and peak hour volume, as well as a reduction in total and injury accidents on I-94. In 1995, the system was expanded once again, bringing the number of ramp meters deployed along freeways in Detroit to over 60. Ramp management goals, objectives and strategies should be consistent with regional transportation goals and objectives and must support the mission and vision of the agency. Ramp management goals, objectives and strategies should be defined at the regional level and should fit into the context of the broader transportation planning process, including the freeway management program. Freeway management is defined as “the implementation of policies, strategies and technologies to improve freeway performance.” Although the flow of people and goods is a valid concern, it should be expressed that freeways should be operated in a manner that is consistent with the goals and objectives of the overall surface transportation program. In other words, agencies should not implement strategies that improve the flow of people or goods if such strategies do not support local, regional, and statewide surface transportation system goals and objectives. For instance, ramp metering is a strategy that may improve the flow of traffic. However, if policies are not in place and resources are not available to operate and maintain this strategy, deployment may actually result in public contempt for ramp metering. This in turn will impede the agency’s ability to effectively manage traffic. The selection and implementation of ramp management strategies must be based on needs. Ramp management strategies will obviously deliver greater returns if there are needs to address and if the identified needs can be addressed through ramp management approaches. Ramp Closure – Ramps may be closed on a temporary, intermittent, or permanent basis. Ramps are often closed due to potential or severe impacts associated with geometric deficiencies on the ramp, or impacts that result from an abnormal mix of vehicles (e.g., high percentage of trucks). Ramp Metering – The rate at which vehicles enter a freeway facility may be controlled through the use of traffic signal(s) (i.e., meters) deployed on freeway entrance ramps. Ramp meters may control ramp traffic based on conditions in the field or manually to optimize the release of vehicles entering the freeway facility. Special Use Treatments – Preferential treatment may be given to a specific class of vehicle entering or exiting freeway facilities. For instance, a separate lane on a metered ramp may be used by multi-occupant vehicles or transit vehicles to bypass ramp meters and the queues they form. Similarly, an entire ramp may be allocated for use by special vehicle classes like transit and emergency vehicles. Ramp Terminal Treatments – Improvements (e.g., signal timing, widening lanes, pavement makings, adding turn lanes, etc.) may be made at the ramp terminal to improve existing conditions, and/or to maximize the benefits of other ramp management strategies like ramp metering. Although each of these strategies alone can be used to manage traffic on ramps, they are often used in combination with each other to deliver maximum benefits. The specific types of strategies selected for managing ramp traffic depends on the objective of the ramp management program. Additional information pertaining to each strategy can be found in Chapters 2 and 5. Before and after evaluations of ramp management strategies offer strong evidence that operations on ramps, freeways, and even adjacent arterials are improved once these strategies are appropriately implemented and operated. The benefits for some strategies such as ramp metering are widely documented in the literature, but documentation of the benefits of others, such as ramp closure and ramp terminal treatments, are much scarcer. The apparent lack of literature that report the benefits of certain ramp management strategies may be in part related to the frequency in which ramp management strategies are implemented. Full ramp closure, for example, has not been implemented nearly to the extent ramp metering has and, therefore, the logical conclusion can be drawn that less research pertaining to ramp closure will be available. Ramp terminal treatments, on the other hand, are comprised of accepted, low-cost traffic engineering practices that are rarely evaluated exclusively in ramp terminal areas. Despite the lack of research, the existing literature offers a sufficient amount of evidence to determine the impact of strategies and their effectiveness in reducing congestion, improving safety, and addressing other transportation problems. Although different in their approach, ramp management strategies can improve safety not only on the ramps in which they are deployed, but also on the freeway and adjacent arterials. Freeway congestion that forms at or immediately upstream of merge areas is often a result of large platoons of vehicles entering the freeway from a ramp. These vehicles must compete for gaps in mainline traffic, limiting motorists’ ability to focus on traffic in front of them. Adding to this problem are geometric deficiencies that make weaving operations at the ramp-freeway merge point more complex. Such deficiencies include horizontal and vertical curves, closely spaced ramps, and inadequate acceleration or deceleration distances. As a result, rear-end, sideswipe, and lane change collisions may occur on the freeway or ramp. Similarly, vehicles waiting to enter metered ramps may form queues on the arterial, which consequently increases the chance for collisions (especially rear-end collisions). To a large extent, collisions attributed to merging problems can be reduced by breaking up platoons so vehicles are not forced to compete for the same gaps in mainline traffic. If repeated on a system-wide basis, the overall operation of the freeway may be stabilized, and crashes that result from stop-and-go driving behavior may be reduced. For instance, a 2001 before and after evaluation of ramp meters in Minneapolis found that the number of peak period crashes on metered freeways and ramps increased 26 percent when meters were turned off. This report seems to verify the findings of a previous study that reported that the average number of peak period crashes decreased 24 percent as a result of ramp metering. Table 1‑1 provides a summary of reported safety benefits of other ramp metering programs. 43% reduction in peak period collisions. 24% reduction in peak period collisions. 39% reduction in collision rate. 50% reduction in rear-end and side-swipe collisions. 50% reduction in total collisions and 71% reduction in injury collisions. 15% reduction in collision rate. Ramp management may significantly improve conditions on the freeway, resulting in benefits to mobility and productivity. By managing the rate at which vehicles are allowed to enter a freeway, practitioners can set limits based on downstream capacity to maintain a pre-determined operational objective. Operational characteristics that may be improved, leading to greater throughput while maintaining freeway operation, include speed, travel time, and delay. Table 1‑2 provides a summary of ramp metering mobility and productivity benefits. A 173% increase in average travel speed. A 16% increase in average peak hour travel speed and a 25% increase in peak period volume. A 52% reduction in average travel time and a 74% increase in traffic volume. A 57% increase in average peak period travel speed and a 37% decrease in average travel time. An 8% increase in average travel speed and a 14% increase in traffic volume. A 9% increase in average travel speed. There is a known direct correlation between improved traffic operations and environmental improvements, as discussed in the previous section. First, and perhaps most important, are reductions in the amount of emissions released into the environment. As the time spent in stop-and-go conditions decreases and average vehicle speeds increase nearer to posted driving speeds, the amount of vehicle pollutants released into the environment decreases. The evaluation of ramp meters in Minneapolis identified a net annual saving of 1,160 tons of emissions.8 An increase in travel speed also improves fuel efficiency, leading to reduced fuel consumption and cost savings. Ramp management and improved operations on freeways also have qualitative benefits. Improved traffic flow, decreased travel times, and improved safety all work together to ease motorists’ concerns and frustrations. These improvements also help improve motorists’ perception of regional transportation officials and agencies, making it easier for these groups to acquire the needed funding to develop, implement, operate, and maintain transportation improvements. The results of the evaluation conducted in Minneapolis indicated that motorists generally thought conditions got worse after meters were turned off compared to when they were operational. An effective transportation system consists of a coordinated, inter-related set of strategies, procedures, and activities intended to meet the goals and objectives articulated in an agency’s vision statements and policies. At the most basic level, ramp management efforts must support the vision and mission of the agency that implements them. Ramp management should be considered as an element of the overall transportation management system, not as something that operates in parallel to or separate from it. Ramp management strategies need to be considered as ways to meet the goals and objectives articulated in the agency strategic planning process. The relationship between ramp management and the freeway management program is similar to the relationship that exists between freeway management and the broader surface transportation program. Ramp management seeks to satisfy freeway management goals and objectives in a similar way that freeway management works to satisfy surface transportation goals and objectives. Ramp management programs must work with other surface transportation programs and freeway management programs, respectively, to ensure that freeways, and in turn the surface transportation system, are optimally operated. In addition, the integration of freeway management strategies and programs with other surface transportation programs is critical for seamless transportation operations. Understanding both the nature and magnitude of a particular congestion and/or safety problem, including current issues (i.e., reactive), and potential future ones (i.e., proactive). Combining various operational strategies, policies, and systems into a comprehensive program. Using technology, detection and verification systems, communication links, traffic operations centers, motorist information systems, and information sharing among systems. Implementing a high degree of inter-agency coordination and cooperation to provide emergency services and to restore accident scenes to normal operation in the shortest possible time. Deploying and implementing highly sensitive and sometimes controversial management strategies, such as ramp meters and high-occupancy vehicle lanes. Managing extremely popular services such as tow trucks and patrols to rapidly remove disabled vehicles from freeways. Reduce the impacts and occurrence of recurring congestion on the freeway system. Minimize the duration and effects of non-recurring congestion on the freeway system. Maximize the operational safety and efficiency of the traveling public while using the freeway system. Provide facility users with information necessary to aid them in making effective use of the freeway facilities and to reduce their mental and physical stress. Assisting users who have encountered problems (crashes, breakdowns, confusion, etc.) while traveling on the freeway system. Similar to the relationship between freeway management and the surface transportation program is the relationship between ramp management and the freeway management program. Ramp management is a single function that falls under the freeway management “umbrella” that is performed on a daily basis to fulfill agency-defined objectives of the freeway management program. Ramp management elements work with elements of other freeway management programs to deliver freeway management system goals and objectives. This relationship can be likened to puzzle pieces, with ramp management representing just one of these pieces (see Figure 1-2). The freeway management functions that comprise a freeway management program are identified in Figure 1-2, and their relationship with regard to ramp management is described below. HOV Treatments – Preferential treatment of HOVs and other vehicle classes have been successfully used to bypass single-occupant vehicle (SOV) queues at ramp entrances. Information Dissemination – Information dissemination techniques employed by other freeway management functions may be used to inform to motorists en-route or pre-trip about the current operational status of ramp meters. Additionally, motorists may be alerted to planned ramp closures as well as construction activities on or near the ramp. 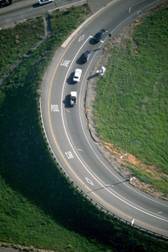 Surveillance and Incident Detection – Surveillance and incident detection systems are used to determine and adjust freeway and ramp operational conditions. Data from detectors installed on either the ramp or mainline can be used to set or adjust ramp metering parameters. Closed circuit television (CCTV) can be used to visually verify that ramp meters are functioning properly or to observe the effects of ramp metering on traffic flow. Incident Management – Incident management procedures and plans may be integrated with ramp management to improve safety and restore operations on ramps and the mainline in a more timely fashion. Through active management of ramp meters and other devices, operators may monitor freeway operations during emergencies and clear ramp queues to allow a more timely response to emergencies. Lane Use Control – Lane use controls may be used to direct motorists to use certain lanes and to merge out of other lanes. Lane use controls are usually used either in reversible lane operations or to close lanes because of road work or incidents. Ramp management strategies can be used in conjunction with lane use controls to manage the demand, leading to freeway sections where lane use controls are active. This handbook was prepared in part to address the need to provide practitioners with a technical reference that offers guidance and recommended practices on managing and controlling traffic on ramps with freeway facilities. The use or application of the comprehensive guidance and recommendations provided here will in time serve to enhance the use and effectiveness of the ramp management and control strategies presented in this handbook. This handbook also describes in greater depth the issues and concepts specific to ramp management and control that were presented in Chapter 7 of the Freeway Management and Operations Handbook. The Freeway Management and Operations Handbook was released by the Federal Highway Administration in September 2003, and has since been updated to summarize the guidance presented in this handbook. The primary purpose of this handbook is to improve the operation of freeways and their associated ramps by providing support, information, guidance, and recommended practice to practitioners responsible for freeway management and operations. The use or application of these recommended practices will, in time, serve to enhance the use and effectiveness of various ramp management and control strategies and techniques. Recommended practices can provide a basis to improve understanding of the dynamics of ramp traffic flow and the influence it has on the operation of the freeway system as a whole. For example, transportation planning must reflect not only the characteristics of mainline freeway flow, but also the impact that ramp-based traffic flows have on the overall operation of the freeway. Improvements should be designed with the operation of the ramp as well as the mainline in mind. The location and geometry of ramp improvements can either facilitate or detract from the ability to control ramp volumes through the use of ramp metering and other management techniques. Objective 1: Identify and understand four ramp management strategies and the specific techniques for applying each. Objective 2: Understand how ramp management fits into an agency’s traffic management program. Objective 3: Understand the various issues that need to be considered to develop and select an appropriate ramp management strategy. Objective 4: Understand the various issues that need to be considered to implement selected ramp management strategies and plans. Objective 5: Understand the strategies and approaches that keep selected ramp management strategies operating effectively over time. Objective 6: Identify the importance of performance monitoring, evaluation and reporting, and the steps in applying these tasks so ramp management programs are continuously improved. This handbook was developed with the specific intent of clearly and precisely presenting information in a way that is both understandable and useful to all those interested in this topic. However, the content contained in this handbook was prepared taking into account the typical needs of transportation professionals charged with the responsibility of implementing, operating, and maintaining ramp management strategies. Although these individuals comprise this handbook’s primary audience, consultants, contractors and researchers that have an interest in ramp management will find this handbook, or parts of it, beneficial. This handbook will primarily benefit the wide array of practitioners responsible for or affected by the implementation of ramp management strategies and the systems and devices that support them. This group of practitioners includes: traffic managers and decision makers, engineers, planners, designers, and operations staff. Also included are representatives of state DOTs, local agencies, Metropolitan Planning Organizations, and transit agencies who may be involved in the planning, design, monitoring, operation, evaluation, and reporting on the performance and influence of managing traffic at freeway ramps. In addition to the individuals identified in the previous section, consultants, contractors and researchers may also benefit from the discussion and concepts expressed in this handbook. This group of individuals may use this handbook as a resource when completing projects and or addressing concerns on behalf of their clients. The development of this handbook stemmed from the need to deliver guidance to individuals interested in ramp management. Before this handbook was developed, there was no single, comprehensive guidebook dedicated to ramp management and control. Chapter 7 of the Freeway Management and Operations Handbook discusses the subject, but not to the level of detail that has been developed here. This handbook synthesizes existing literature, builds on what is being done in current practice, and utilizes the knowledge of technical experts from around the country in its review and content. Provide an overview of ramp management, its associated strategies, organizational and operational considerations in managing ramp traffic, and how to monitor ramp performance and evaluate improvements. Enhance the understanding of ramp management strategies and corridor traffic management, how they relate to one another and how they affect the operation of the freeway and the transportation system as a whole. Explain the importance of effective planning and design practices of ramp improvements for the operation of the transportation system. Recently there have been a number of resources developed to enhance the freeway management practitioners’ set of tools to address freeway safety and congestion-related issues. These tools include a series of handbooks presenting guidance and effective practice in the broad area of freeway management and operations. These include: the Freeway Management and Operations Handbook, Incident Management Handbook, Special Events Handbook, Communications Handbook, HOV Systems Manual, Traffic Detector Handbook, and the Traffic Control Systems Handbook. This Ramp Management and Control Handbook will add another critical tool to this set. This handbook consists of 11 Chapters grouped into four sections and an Introduction (i.e., Chapter 1). Section 1 (Chapters 2-4), titled Getting Started, presents all the processes and issues an agency should consider and/or complete before ramp management strategies are developed and implemented. Issues and activities relevant to traffic managers, which they may or may not be able to control, are discussed. 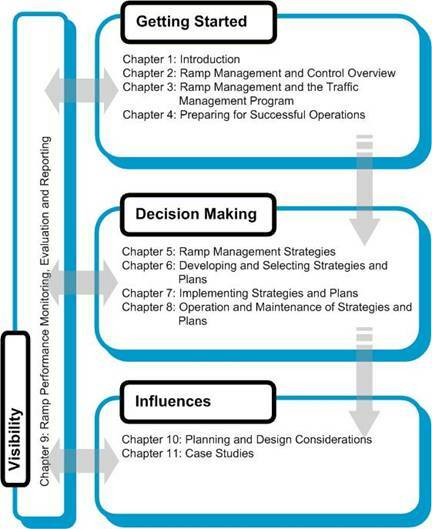 Section 2 (Chapters 5-8), titled Decision Making, provides all the information that a traffic manager needs to develop, implement, operate and maintain ramp management strategies. Section 3, titled Visibility (Chapter 9), provides guidance on how to monitor, evaluate, and report the impacts associated with the implementation of selected ramp management strategies. The last section, titled Influences (Chapters 10 and 11), provides design considerations and case studies that may be used by practitioners seeking assistance in implementing ramp management strategies. A chapter-by-chapter summary for each of the four sections is provided in Table 1‑3 through 1-6, respectively. A breakdown of chapters contained in each section is shown in Figure 1‑3. This chapter provides an overview of the ramp management and control issues and activities that are examined in this handbook. This chapter describes how ramp management fits into an agency’s overall program and structure, including the traffic management program, from the perspective of the individual(s) that will be implementing and operating ramp management strategies (e.g., Traffic Management Center (TMC) supervisors and managers). The focus of this chapter is on how ramp management fits in with the broader agency program, and the issues and activities that are necessary to support ramp management and control that the Traffic Manager can influence, but not control. This chapter continues the discussion of how ramp management fits into an agency’s traffic management program but concentrates on the issues and activities that occur at the TMC supervisor level and below. In other words, the issues and activities that can be controlled by the Traffic Manager, as opposed to Chapter 3 which focuses on the issues and activities that the TMC supervisor has influence, but little direct control. This chapter introduces and describes commonly used strategies that may be implemented to better manage traffic on and adjacent to freeway ramps. This chapter builds upon the high-level discussion of ramp management strategies presented in Chapter 5, and furthers it by discussing the various issues that agencies should take into consideration when developing and selecting an appropriate ramp management strategy. This chapter builds off the previous two steps discussed in depth in Chapters 5 and 6, and furthers this discussion by addressing the various issues and activities associated with the implementation of ramp management strategies and plans. This chapter discusses considerations to keep the ramp management strategies operating effectively. This chapter describes the process of monitoring, evaluating, and reporting the performance of ramp operations and the ramp management strategies selected and implemented in Chapters 6 and 7, respectively. This chapter supplements Chapter 7 by addressing issues and activities that need to be considered when implementing individual capital projects that have already been approved and funded, and support the overall ramp management strategy implemented in Chapter 7. This chapter provides practical examples and experience that illustrates various aspects of planning, deploying, and operating ramp metering systems by providing overviews of the experiences of various agencies that have implemented ramp metering and other ramp management strategies in their cities. The use or application of guidance provided in this handbook serves to enhance the use and effectiveness of ramp management and control strategies. It is believed that agencies including state DOTs, local agencies, Metropolitan Planning Organizations, and transit agencies will use the concepts and guidance expressed in this handbook to further develop effective practices to plan, design, operate, monitor, evaluate, and report on the performance and influence of managing traffic on and near freeway ramps. Showing interdependence between other programs and initiatives. Identifying gaps in the state-of-the-practice and advancing it forward. Identifying issues that cut-across the different transportation management program areas. First line supervisors and technical staff. Ways each group can effectively use this handbook are described below. At a minimum, agency decision makers should review Chapters 1 and 2 to obtain a high-level view of ramp management, including the strategies used to address issues and the considerations to think about when implementing strategies. These chapters will give agency decision makers the most comprehensive understanding of ramp management strategies and issues, without having to invest the time needed to read the entire handbook. The remaining chapters of the handbook can be referenced on an as-needed basis to obtain more detailed information. It is recommended that TMC or traffic managers read and understand this entire handbook. Initial focus should be on the first four chapters. As ramp management projects move into the project development stages, Chapters 5 through 8 should be reviewed. Chapter 9 is important to review in on-going situations; especially as new elements are implemented and new capabilities to collect performance measures are developed. Chapter 10 should be reviewed at the beginning of any new capital improvement project that affects ramp management. Chapter 11 should be reviewed when the manager wants to gain deeper understanding of how others have implemented ramp management. First line supervisors and technical staff have different roles and responsibilities and are therefore likely to benefit differently from the information and concepts expressed in this handbook. Regardless of their roles and responsibilities, all first line supervisors and technical staff should review Chapters 1, 2 and 5 to gain a basic understanding of ramp management and ramp management strategies. In addition to these three chapters, operations staff should review Chapters 7 and 8 to understand on-going implementation, operation and maintenance issues. Traffic analysts and engineers on the other hand should focus on Chapter 9 to gain understanding of the role and methods of performance monitoring. Designers and design support staff should review Chapter 10 at the beginning of each capital improvements project that involves ramp management. 3. McDermott, J.M., S.J Kolenko, and R.J Wojcik. Chicago Area Expressway Surveillance and Control: Final Report. Illinois DOT. March 1979. 5. ITS Deployment Tracking Website: Year 2000 Deployment Tracking Summary for Chicago, Il; Gary, IN; Lake County, Il. U.S. Department of Transportation. http://itsdeployment2.ed.ornl.gov/its2000/MetroResults.asp?MetroID=14&CT=T. Accessed April 19, 2005. 6. Taylor, W. T. Maleck, and L. Kostyniuk. An Evaluation of the Detroit Freeway Operations (SCANDI) Project. Michigan State University. College of Engineering. Publication FHWA-MI-RD-88-02. 1998. 7. ITS Overview. Michigan Department of Transportation Website. http://www.michigan.gov/mdot/0,1607,7-151-9621_11041_14581-50156--,00.html. Accessed April 19, 2005.